For UK film photographers with a strict budget, there’s some good news from one of the high street’s most wallet-friendly retailers. 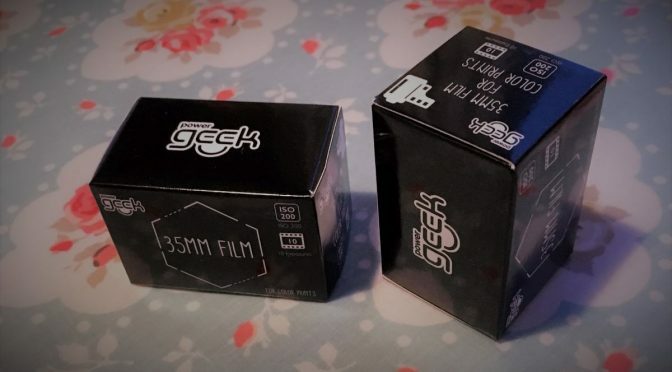 Poundland, which has nearly 900 stores across the UK, has recently brought film back to its stores with its new offering, Power Geek 35mm film. The film is 200-ISO colour print film (most probably Fujicolor C200), and comes the chain had to drop Agfaphoto Vista 200 from its roster in 2017 when the film was discontinued. That film was available in 24-frame rolls for under £1. As far as Kosmo Foto is aware, no current film is available in such small quantities. Has the film been bulk-loaded, possibly from disposable cameras? CN16, incidentally, is Fuji’s in-house designation for C-41 processing, which also adds weight to the speculation that this is a Fuji colour film. The Poundland launch has been met with some criticism by UK film photographers, with some pointing out labs would most likely charge you the same as they would for a 36-exposure roll when it came to developing and scanning it. Canny Cameras echoed this view, noting that the film would still cost as much as a 36-exposure roll when it came to being processed and scanned, working out three times as expensive per frame as some other 36-exposure rolls available in high-street chains. This seems a strange move by Poundland, who gained significant kudos when they sold Vista 200 for such a low price. Given the deals such a large retailer is able to strike with distributors, it’s odd that they’ve gone with such a low number of frames. Why not charge a little more for a 36-exposure roll? After all, it’s not as if they’re selling this stuff for only £1. It may be decent value if you want to run a test roll through a half-frame camera. Niche product though!